In [1, pp. 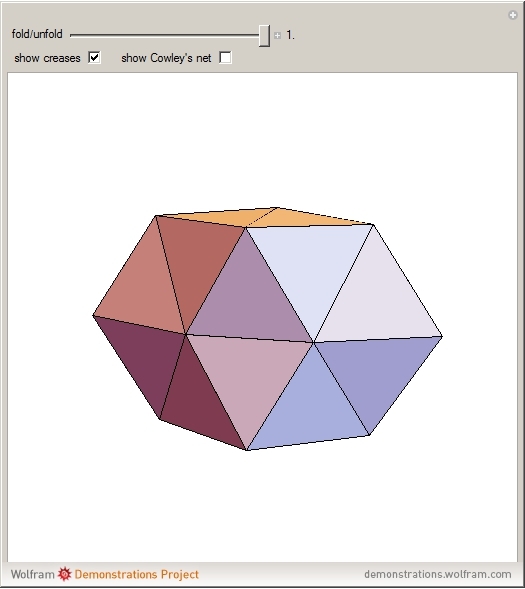 2–3] and [3, p. 22–23], it was shown that Cowley's dodecarhombus net does not consist of golden rhombuses or of rhombuses of a rhombic dodecahedron, so it cannot be folded into a convex polyhedron. However, it can be folded into a nonconvex polyhedron by introducing additional creases. 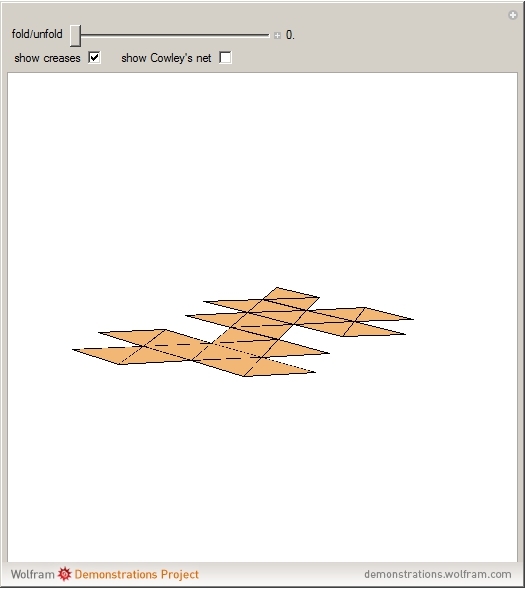 One solution: by considering Cowley's rhombuses as hinged equilateral triangles, the net can be folded into a nonconvex polyhedron. Thus, in this case, rhombuses are a kind of skeleton in the sense of [4, p. 282], although not all dihedral angles are congruent. See [5, p. 79] for more about Cowley's books. "Rombski poliedri." (Jan 7, 2019) www.logika.si/revija/Stare-revije/revija15-5.pdf. J. L. Cowley, Geometry Made Easy: A New and Methodical Explanation of the Elemnets [sic] of Geometry, London: Mechell, 1752. B. Grünbaum. "The Bilinski Dodecahedron, and Assorted Parallelohedra, Aonohedra, Monohedra, Isozonohedra and Otherhedra." (Jan 7, 2019) digital.lib.washington.edu/researchworks/bitstream/handle/1773/15593/Bilinski_dodecahedron.pdf. P. R. Cromwell, Polyhedra, New York: Cambridge University Press, 1997. M. Friedman, A History of Folding in Mathematics: Mathematizing the Margins, New York, NY: Springer Berlin Heidelberg, 2018. Wikipedia. "Bilinski Dodecahedron." (Jan 7, 2019) en.wikipedia.org/wiki/Bilinski_dodecahedron.